Working with groups from kindergarten through adult, Ben Darling offers residencies in two-dimensional media including painting, drawing and printmaking. Residency activities may focus on murals, abstract painting, landscapes, painting in watercolor, tempera, acrylic, and oils, drawing, or relief printmaking. 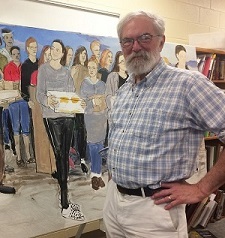 His extensive experience as an art teacher has kept him current with the use of educational learning standards in the art classroom. Professionally, Darling produces and exhibits artwork in the all of the mediums he explores in his residencies. Darling is comfortable working with sponsors to meet their needs. Teachers and their students will gain insight into the art making process and techniques. Darling earned his B.F.A. from UNL, and after several years away from the AiS/C program, is excited to return to the NAC Artist Roster.